I hope the hive isn't this broken in reality. Written by doef1997 on March 31st, 2019. We all pine for simpler times, don’t we? Or is that just a cliché movie line that nobody uses in the real world? Either way, the imagination of a child can be magical and as we get older, sometimes we must let parts of our youth get left behind — because apparently there’s no place for spaceships and three-eyed aliens in the ‘grown-up’ world. 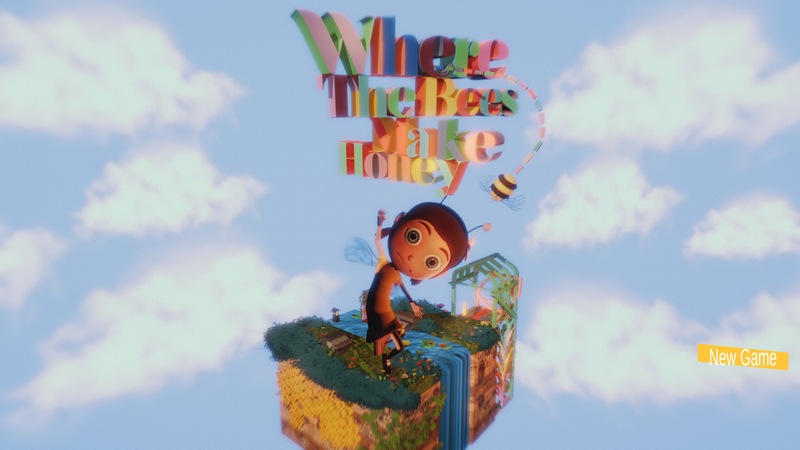 Despite me being told this regularly, that’s the premise of Where the Bees Make Honey; a puzzle-adventure of sorts that sees you assume the role of Sunny, a frustrated adult stuck in a boring office job, who decides to relive some of her childhood memories through her vivid imagination. Sunny’s story may seem relatable to many. The feeling of entrapment in a dead-end job you don’t enjoy that would surely some warrant a feeling of escape, right? With that in mind, Sunny sets about leaving her office to turn on a generator in the basement. This then triggers your surroundings to become vivid woods, lush green fields, and dirt-covered backyards to explore. 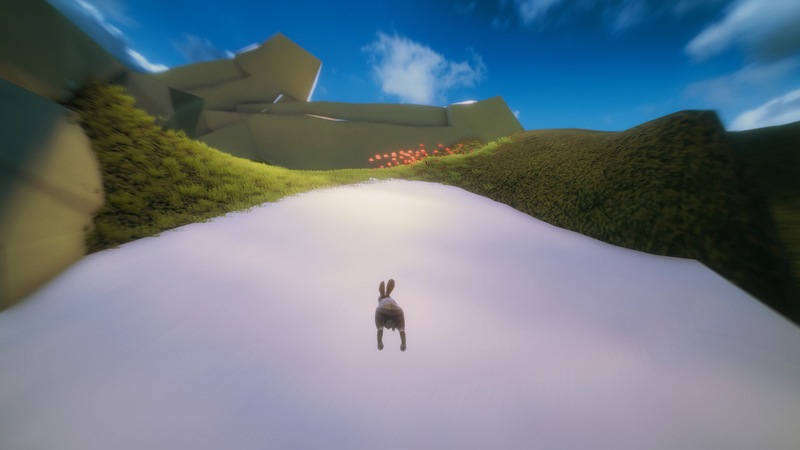 Exploration comes in the form of varying perspectives; for example, in the backyard you take control of a monster truck toy, whereas in the fields you become a rabbit that must traverse the landscape. Visually it’s quite captivating — the art style throughout the game shifts at several points and has some merit to its aesthetic. I love taking screenshots and Where the Bees Make Honey gave me plenty of opportunities to do so. The Fez-type sections are fantastic. However, the game’s visuals are sadly one of the few captivating things about it. The blatantly on-the-nose metaphors throughout were more of a turn-off for me than they may be to some. It is more of a personal preference I suppose, but if I’m sharing my personal thoughts (which I am, not those of MTV) Sunny’s memories are quite frankly, boring. The game takes place through the cliché seasons system where spring is rebirth, winter is bad, etc., and several memories present themselves. The metaphorical spring level is about Sunny getting lost in a supermarket (as to how that makes her represent herself as a bunny even in her imagination is beyond me), summer is the tale of her playing with cars in the back garden (her pretending to be a car I can understand better), and fall/autumn is a tale of her trick-or-treating and pretending the other kids are terrifying monsters for real. All three scenes are just a bit dull; not “bad”, but really nothing that would win an Oscar for storytelling. Even if the simple life is what Sunny yearns for, this is all just a bit too simple. The winter memory hints at how Sunny burnt down a forest as a child, which you’d think is pretty defining for her as a person (a theme she keeps banging on about throughout the game), yet it’s never touched upon again. Like I say, maybe the mundanity of her memories is sort of the point, but then again isn’t that what Sunny claims she is trying to escape? Sunny is also obsessed with bees and dressing up as one. 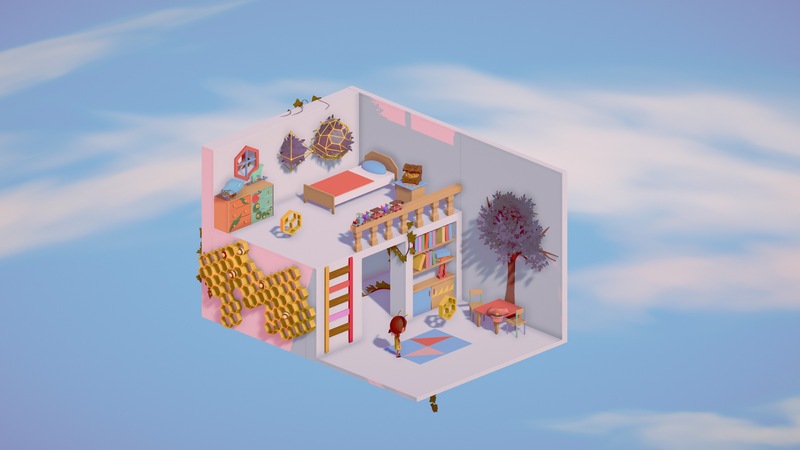 Each level features some sort of allusions to the stripy, honey-bearing blighters, and the end of each incorporates the “puzzle” aspect of the game. Players have to collect three pieces of honeycomb to finish a level, with the puzzle taking the form of using the triggers to rotate the screen and gain new perspectives on things Fez style. Whilst these portions of Where the Bees Make Honey were absolutely the best parts, they were few. I’d have happily spent the ~1-hour runtime of the game just doing those, but alas, I could not. Up until this point, I’d describe everything as fine — a competent walking simulator/adventure game that is forgettable but has some highlights. But brace yourselves kids, because man oh man do technical issues hinder the game. At times I couldn’t tell if the framerate was intentionally stuttering or if it was just poor optimization. Loading screens often froze for extended periods of time, alongside interactions within levels failing to register to your button prompts which made certain jumping sections of the game hugely frustrating. All these things I can have some leniency towards, but not when they are so frequent. To top it off though, as the icing on the cake (yes, I’ll use my own metaphors now), I genuinely had to play through the game 10 times to reach the end. This isn’t because of any replay value (as a side note there are two endings with one having such a minor difference that to try and get through the game again was seriously testing my patience by this point), but because the game repeatedly crashed and the save data corrupted every time it happened. The main menu has a “continue” option, which is completely irrelevant because 95% of the time it doesn’t work, and you are forced to restart the game fresh. Not ideal really. I’ve recently played other games that made me mad, but none like this for a while. As I always mention, only a lack of ice cream should get me this worked up. The controls in this section are not fun. I hate being a Debbie downer (apologies to anyone called Debbie reading this) but I cannot in good faith try and justify the broken aspects this game currently severely suffers from. They are quite literally game-breaking issues. Whilst I’m no developer, I have great respect for anyone who makes a game and if anyone designing one reads this, you’ve got talent so keep going. To release Where the Bees Make Honey in its current state is a bit cheeky if I’m honest. The visuals of the game and the short puzzle sections really do give some credence to the title, and there’s also some fantastic music. Otherwise though, I hate to say it, but the narrative just isn’t all that compelling and whatever messages the game did try to preach to me were swiftly cast aside by the rage I had at yet another game crash. I’m sorry Where the Bees Make Honey, but you just weren’t sweet enough for me. What few aspects of the game stood out to me, whilst not wholly original yet still interesting, were drowned in a sea of bugs and technical issues. As a well-known TV show once said — ‘it’s a no from me’. Fun Factor: I had fun the first time. Not the tenth. Graphics: Some of the art style is pretty stunning, I have to give some credit there. Controls: If you can complete the whole thing in a single run then I salute you. Good look getting button prompts to register. Replay Value: Doesn't need replaying at all, but you'll need about ten playthroughs to make it to the game's end in one piece. Sound: There are some lovely scores in this game, credit where it's due. Final Rating: 3/10. What few aspects of the game stood out to me, whilst not wholly original yet still interesting, were drowned in a sea of bugs and technical issues. As a well-known TV show once said — ‘it’s a no from me’. I've said it before and I'll say it again, only a lack of ice cream should make me this mad.